Today’s bike ride took me down to the Marigny to meet S. for coffee and some work and a slow page-turning trip through the Gambit’s 12,000th restaurant guide. As I made my way through cold drink #2 and the last 20 pages of a section of the never-ending book, V. walked in to grab a cup of coffee before opening up Plan B, our community-run bike shop. He stopped by the table and told me to stop by and see all the new bikes they just got in, so after a quick tour of the Bywater I locked up the bike on the corner and headed in. The place was already filled with folks doing all various sundry tasks, but V. took the time to take me on a grand tour, including a visit with a folding mountain bike and a folding cruiser–wild–and a good conversation about how much better life is when you tour it by bike. I snapped this picture while people picked out bikes to build up–the bikes are cheap, but you’ve got to put in your sweat equity and learn some skills. 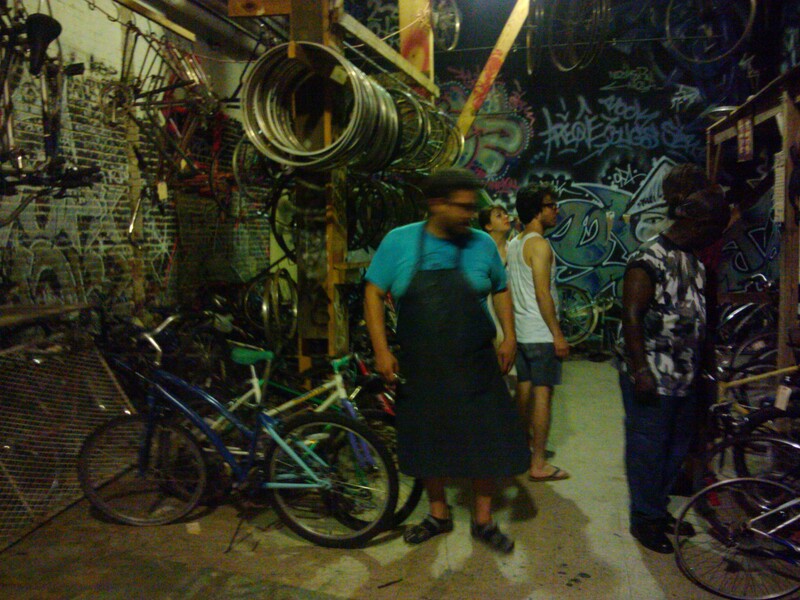 The place is open and welcoming, and they’ve got tools and truing stands and they sell tubes and tires and parts. I’ll be buying my little things from them from now on, and throwing some bones their way. The place is a great resource, and it aims to be a truly community bike shop, open to anybody and everybody who wants to ride a bike, so lets all go there and make that the truth. I got back on my bike, rode along the river, met up with S. and R. for a quick dinner, dropped $20 at Harrah’s, rode over to M.’s for general merrymaking, and then back home in the slightly cooler night air along the fresh asphalt on Orleans, saying my how you doin’s and g’nites and thanking my lucky stars for summertime and bicycles. This entry was posted in bikes and tagged Bywater, Harrah's, Marigny, New Orleans, Orleans Avenue, Plan B. Bookmark the permalink.